As I mentioned during my first Valencia article this trip marked a change in my trips, a change I think I will keep from now on. I think this was influenced by how I perceived restaurants in Valencia but can easily apply to other locations also. Before reaching Valencia I did not research for locations on where to eat. I just got there, got myself something from Viandas and went upon exploring the city at night. Just like in Cordoba I did not enjoy what I bought from Viandas and will keep from buying from them in the future. I know many Spanish people consume their products but I guess this is just a matter of personal taste. So that evening, at my hotel, I cropped a small list of cheap, traditional places where to eat in Valencia. After walking for 20 km each day the last thing you want to do is spend another 2/3 kilometers going to a restaurant where you could have the surprise to catch it closed or out of food. Out of food you said? Yes, it happened to me on my second day in Valencia. All the food prepped for that afternoon was over and even though the restaurant was open it had no food. Crazy schedule. Most local restaurants open late in the evening and have the place open for 2/3 hours tops. So trust me on saying that I did not want to risk walking for kilometers just to find a place booked or with no food. Just remember on my third day when I reached another restaurant in the evening and from their small menu they were out of some things. Prices. Well, yes. Prices. I found the tapas overly expensive. It is really a shame to ask 2 to 4 euro for a tapa when I remember the delicious meals I had in Andalucia with cheap yet stunning tapas like in Seville, Ronda or Malaga(review coming soon). Food quality. Yes, my experience is limited comparing to how many meals I had in Andalucia but I found the tapas here not to have the same quality. 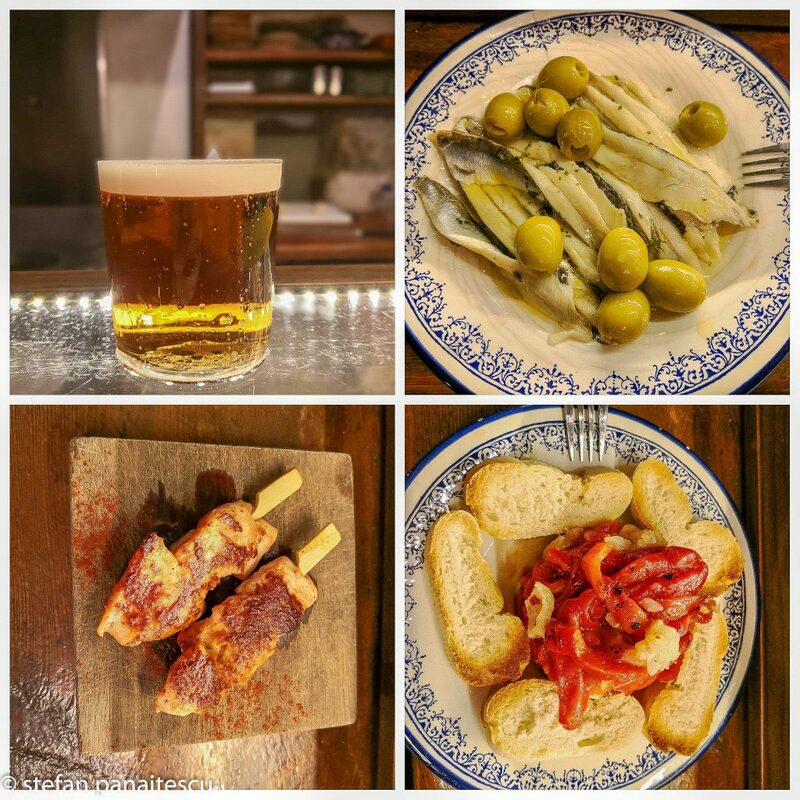 For me, what I tried in Seville, Ronda or in Malaga still sits miles over those tapas that I ate in Valencia. Still better than my tapas at Garum in Cordoba but clearly behind the rest. Crazy schedules again. Most places open after 19:00 hours so if you are hungry during the day you’ll still end up eating in tourist joints during the day. So taking all this into consideration I decided to quit looking at restaurants and bodegas and just eat in the same places over and over again. This way I only tested four places when I could have tried 7 or 8 but having experienced the out of food case after a long day or not having the house specialties left me to wonder if it really matters what I’m eating. And trust me when I say that I don’t feel like I missed out on anything special. Knowing I had no special restaurant to get to, I just made my schedule and when I was hungry went to the places I knew and saved myself a headache. While it might be true that some of you had amazing meals in Valencia and I don’t doubt the city has great restaurants I think the crazy schedules really affected my mood regarding eating out. That and going from – 3, -4 degrees to 21 severely blunted my appetite. 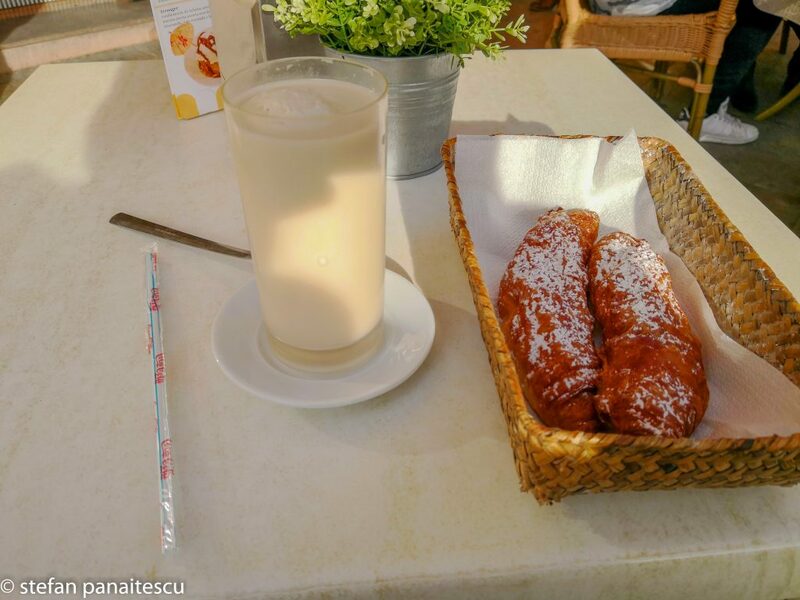 So bellow you will find the three places I used for eating in Valencia and a fourth place where I usually took my breakfast or grabbed a late night horchata. I will also update my frozen yogurt article with an add-on from Valencia where I tried this thing with some success so you might want to read that article also. Lizarran. Ate three meals here and tasted a lot of the tapas so I think I could say a thing or two about them. How much did it cost me? Now I don’t know about you but this is expensive. I did not pay that much for any of those great meals I had in Andalucia so I think the prices here are a bit high. The tapas were OK. I really enjoyed some and some were just OK but I did not have bad experiences and that counts very much. 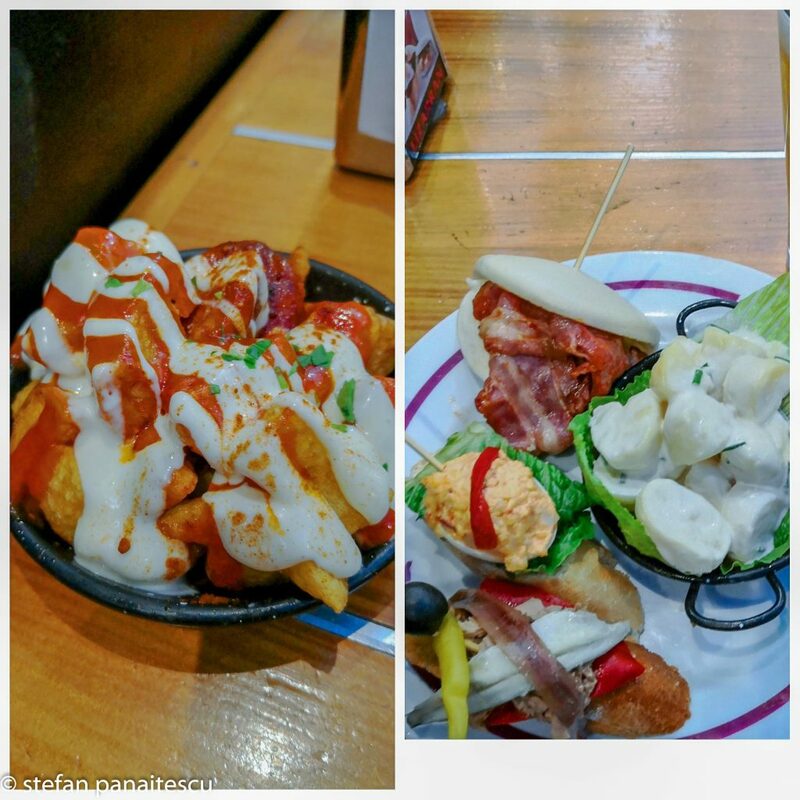 As you can see from my pictures I did eat quite a few tapas each meal but that’s mainly because I ate here after already walking for 10-15 kilometers each day, tired after exploring. The staff is OK and you won’t have much interaction with them. The place is self-service and you just put on your plate anything you want and tell them what you want to drink and pay at the end. 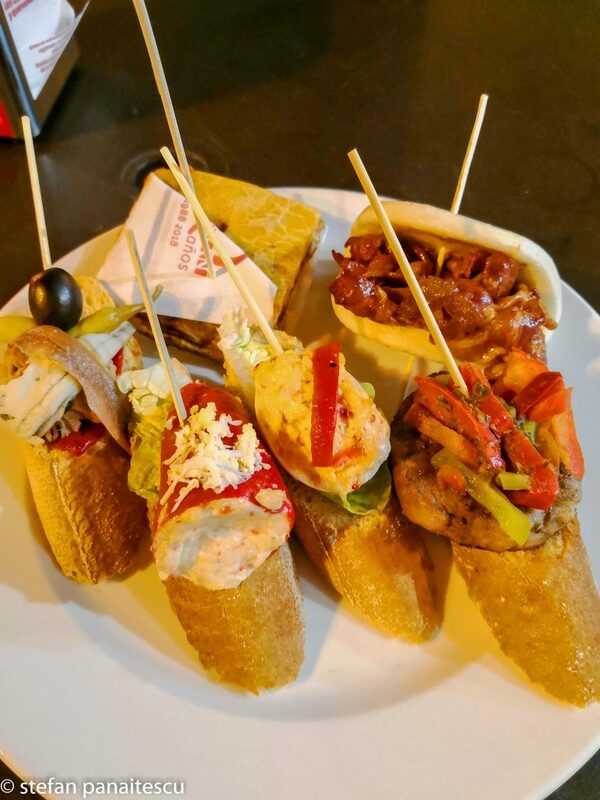 From time to time they move between the tables with new, hot tapas so take that in consideration before filling your plate with cold tapas only. All in all a good option for eating. The price is higher than what I paid in Seville and here tapas are more into the cold side but you can check this place for sure. One evening meal where I had 3 tapas and 1 bear for a total of 13.60 euro. Even though I got there pretty early 2 of the house specialties were finished so I ordered based on their recommendations. For that price I got some pretty OK tapas. Again nothing to write home about but I was hungry and this place is just behind Santa Catalina Tower, close to where I wanted to take some night pictures, so I was happy with the location. While I still believe the price is high if you are in the area it is an OK place in which to eat. La Estrecha is incredibly small and I guess no more than 7-8 persons can fit at the bar and a few more standing plus outside on the little 2 high tables. It certainly gets a pass from me and I would actually advise you to try this thing if you are in the center, wandering the streets near Santa Catalina and The Cathedral and feeling hungry. Well, first of all this is not a typical Valencian restaurant. It is a Basque restaurant. This place is not the usual small tapas bar. It features two levels, the ground floor being a classic tapas/pintxos bar and upstairs a more luxurious restaurant. The tapas were so good that I end up eating 8 of them and drinking Agua de Valencia. All that costed me 21.60 euro. Expensive but at least I really enjoyed the tapas. Same as with Lizarran you get a plate and start piling tapas on it, order a drink and at the end, after having the little sticks counted for, you pay the bill. 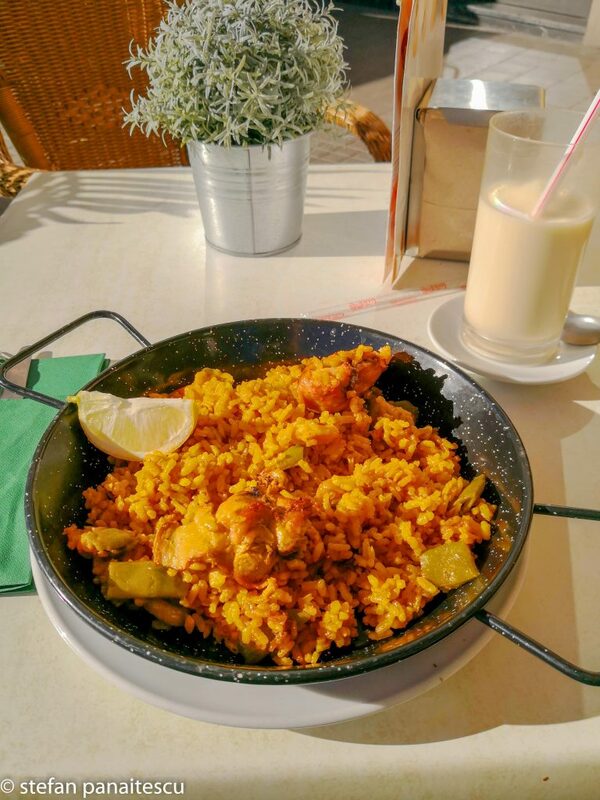 I think that this is the place I enjoy most in Valencia for eating and while this is not exactly local kitchen, their Agua de Valencia is truly amazing. I drank in a few places but this place, Sagardi, is a clear winner. 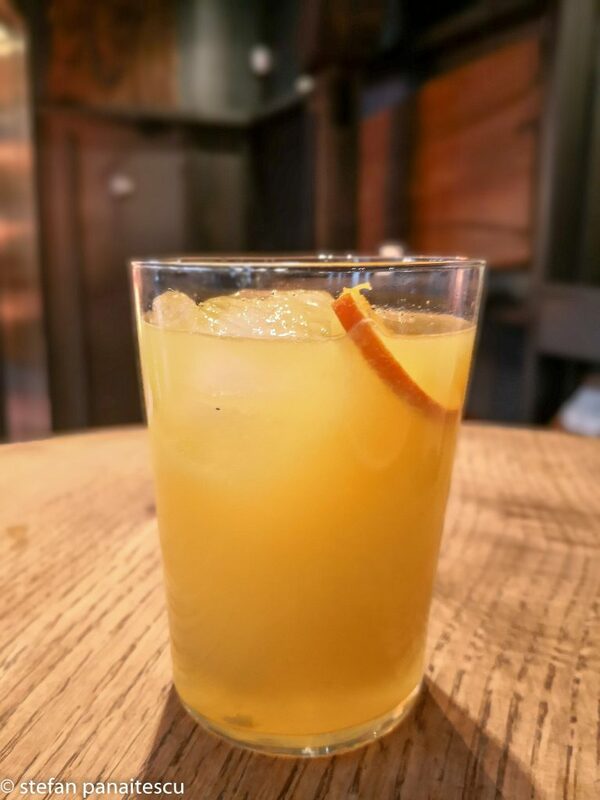 You might offend them for asking Agua de Valencia and not ordering a Basque wine but it is really that good that it is worth it. These are the three places that I tested during my trip to Valencia. 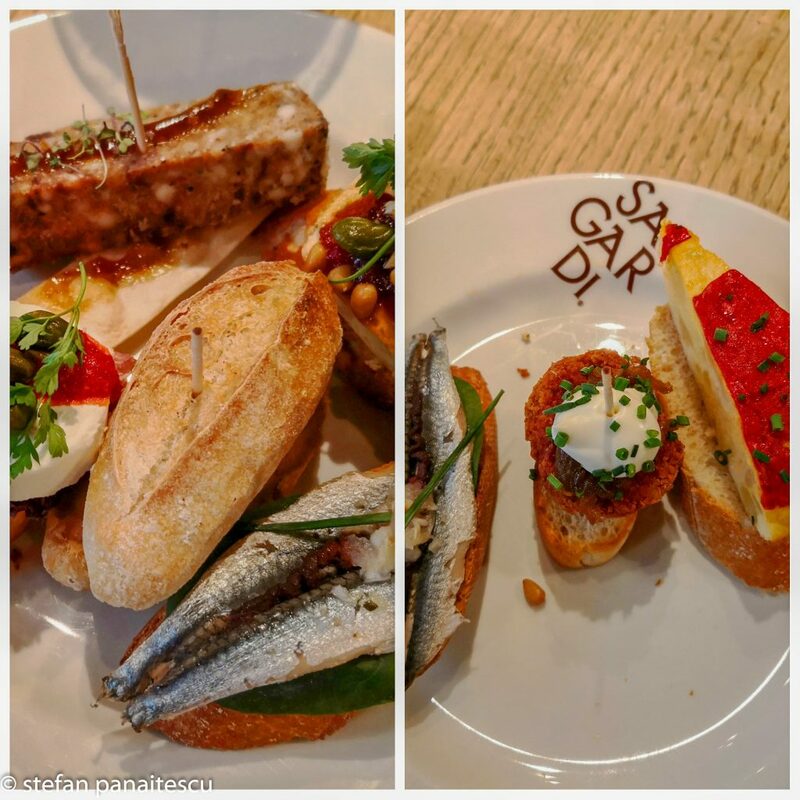 Overall decent food (with quite an OK Basque restaurant) but I truly think that is too expensive. 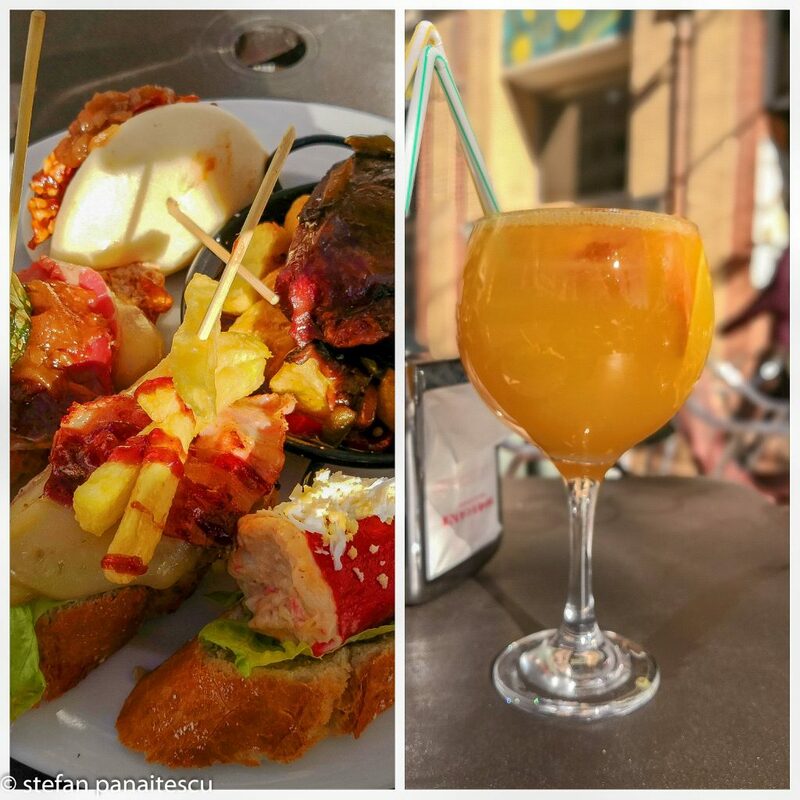 It could be my relatively limited experience but I do think that unlike Seville, Ronda, Granada and other places in Andalucia, Valencia can really put a strain on your budget if looking for tapas and traditional food. Asides from that I have eaten at a local near The Cathedral named Chocolateria Bertal quite a few times. Maybe eaten is a bit much said. I have enjoyed fatrons and an amazing horchata quite a few times and I can highly recommend this place to anyone. 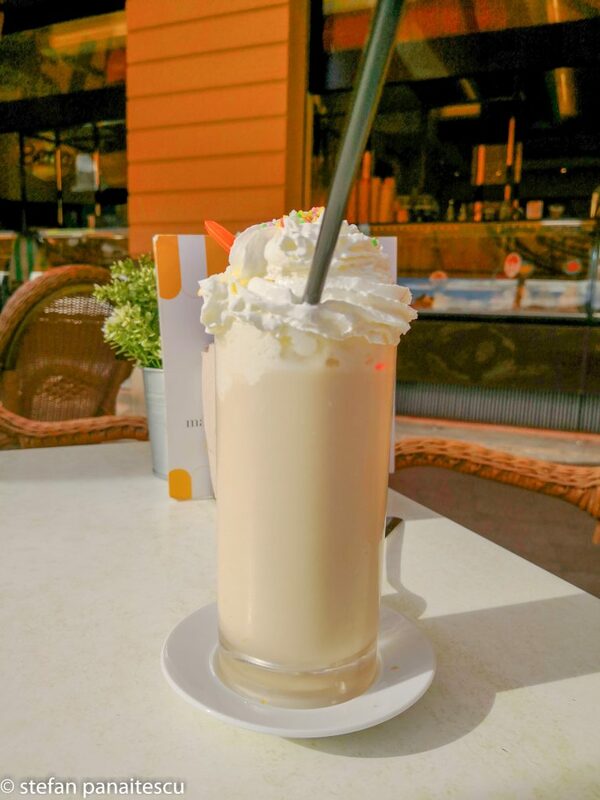 This is by far the best orchata I tried in Valencia (tested in two other places but did not bother to write their names or take pictures) and as I am writing this I do really miss that taste. While I can highly recommend the fatrons and orchata I have no good words towards the paella. Really found it awful and I would not suggest it to anyone. The prices are OK, 2 fatrons and a horchata costed me 6.60 euro, 3 fatrons and horchata with ice-cream in it costed me 8.80 while the paella and horchata costed me 11.45 euro. But then again stay away from the paella here. That pretty much sums it. I know it might be a limited experience but this is how I feel about food in Valencia. Putting aside the taste (where I’m sure that are hundreds of restaurants that can cover all requirements) I really think that food in Valencia is somewhat on the expensive side. I do stress out one thing. Do try horchata and Agua de Valencia. I loved them both. So this pretty much sums it up. Will be back with a new article from England soon so stay tuned!